One of the powerful features of DSM is the “Edit Item”. This allows you to edit important information regarding your item so that it has better chances of being sold. If you are facing some issues with an item, this tool can help you fix it. Let’s explore each function and we will explain how it works. We will also show you the advantages it can bring to your dropshipping business. To Single edit an item, click on the pencil icon located on the left of each item's row in the Price Monitor page. By default, when you list an item this option is already ON meaning that your item is being scanned every 1 hour. But, you can also turn it OFF if you want. 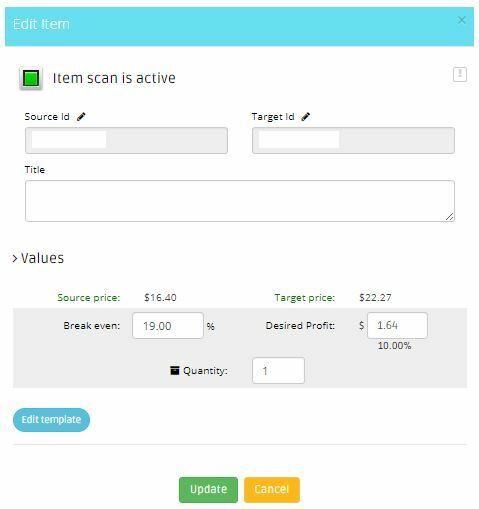 You can read more about how does the Turn Scan Off work from DSM’s Help Center : Turn Scan Off For 1 Item. Sometimes, sources from where you get your listings is not always available or it may be out of stock at the moment, using this feature will save the day. Click the pencil icon beside “Source ID” and it will show a new window where you can paste the URL of the item from its source then click Replace. If you want to add more keywords to the title of your listing, this where you can do that. It has 80 characters ONLY (including spaces), so better maximized it. The percentage to Break Even is how much is needed to raise the final price in order to cover all the fees and taxes. So, you can also adjust it here depending on your preference. This is the reason why we are doing business, to get profit. Adjust it depending on your preference. Setting up the number of available items for your listing is possible here. Adjust it depending on your preference. Changing templates is easy to do in this feature. Just click the “Edit Template” button and then a drop down selection will prompt you showing all the available templates that you have in your account. After you selected your desired template, click “Confirm” to save the change, or click "edit template" to revise the content. Note: Each time you change the template, the description will be pulled from the source original listing replacing previously edited description. Once you have chosen the changes that you want to set on your listing, click “Update” and after a couple of seconds the changes will be applied to your listing. 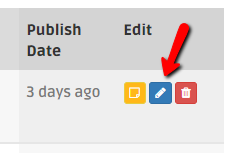 To add a note to the listing, simply click on the note icon and type in the note content. To delete single item, click on the red trash cane icon and choose one of the delete options.